Broadstone was known in earlier times as Glasmanogue. The name is descriptive of a ford crossing place over the Bradogue, a Liffey tributary stream located there. The Bradogue rises in Cabra to the north-west and runs to the Liffey at Ormond Quay. It has long been culverted and now runs almost wholly underground. The Broadstone Station, a former railway terminus, is located opposite the Kings Inns at Constitution Hill. Broadstone is home to a number of landmarks such as the Black Church (St. Mary's Chapel of Ease), King's Inns, The Broadstone Station, the Blessington Street Basin, Berkeley Road Church (St.Joseph), and Royal Canal Bank. Much of the area was originally part of the Grangegorman estate, the demesne, manor house and grounds of the Monck Minogue Stanley family. Broadstone does not have a village centre or main street. The Railway Terminus was the focal point of the neighbourhood. Broadstone's importance was derived came from its location as one of Dublin's six railway termini. Settled by Vikings, the area was part of the Manor of Grangegorman, which was famed for its vast orchards. The green was a common, used for pasture and pleasure. Late 18th-century pictures and reports describe a boggy wetland which became a quagmire in wet weather. The original Irish name of Glas Mochanog, anglicised to 'Glasmanogue', translates as Monck (variant Minogue) Green. 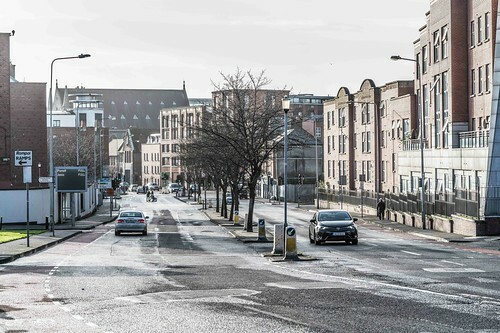 From the Restoration in 1660 the area was used for military parades and pageants to celebrate the Restoration of Charles II, but it was not until the late 18th century and the construction of the Royal Canal that the Broadstone, Mountjoy, and Phibsboro became part of the city proper. Around this time the northern part of the city became fashionable with the Anglo-Irish political and commercial establishment, who made up the ruling and commercial Ascendancy of the emergent semi-autonomous Kingdom of Ireland. Notable among these was the Gardiner family, Earls of Blessington and Viscounts Mountjoy, after which the second Phibsboro neighbourhood of Mountjoy developed. 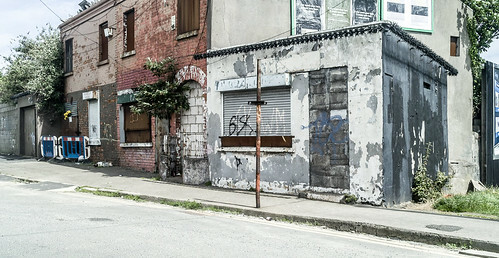 Gardiner Street, Gardiner Place, Gardiner Lane, Gardiner Row, Blessington Street, Blessington Court, Blessington Lane, Blessington Basin, Mountjoy Street, Mountjoy Square, Mountjoy Place and Mountjoy Parade – all in the vicinity – are named for the Mountjoy developer family connections.